You probably spend a ton of time and effort trying to get more visitors to your WordPress site. But despite all that hard work, a good chunk of those visitors bounce away, perhaps never to return. That’s why, beyond simply getting visitors to your site, you need to do everything possible to keep them engaged once they get there. Big companies like Netflix and Amazon have figured out that one of the best ways to do that is with quality content recommendations. On WordPress, that means serving up posts related to content that you know your visitor is already interested in. Done well, this keeps your visitors reading and gives you more time to make a sale, get an email address, or just generally create a new fan of your WordPress site. Not all related posts plugins are equal, though, which is why you need to make sure you pick the right one. To help you do just that, I’ve collected five of the best related posts plugins for WordPress. In order to actually serve up related posts, your chosen plugin needs a way to find content that’s related to the post a visitor is looking at. But how a related posts plugin actually goes about finding that related content is a lot more important than you might think. Some related posts plugins use your own server/database to generate the list of related posts. Other related posts plugins outsource the recommendations to their own servers (AKA not your server) to generate the related posts. The process of finding related content is database intensive, especially on larger sites with lots of content. So if a related posts plugin is using your own server to generate these recommendations, it’s going to gobble up your server’s resources and maybe even degrade your site’s performance. That’s why some managed WordPress hosts will outright ban certain related posts plugins. On the other hand, if a plugin does its processing on a separate server, it’s outsourcing all the hard work to its own server and only giving you the final list, which eliminates the issue I discussed above. So, with that distinction in mind, let’s dig into the best related posts plugins in more detail. If you’ve been using WordPress for any amount of time, you probably know about the Jetpack plugin. This all-in-one offering from Automattic brings a number of popular WordPress.com features to self-hosted WordPress sites. 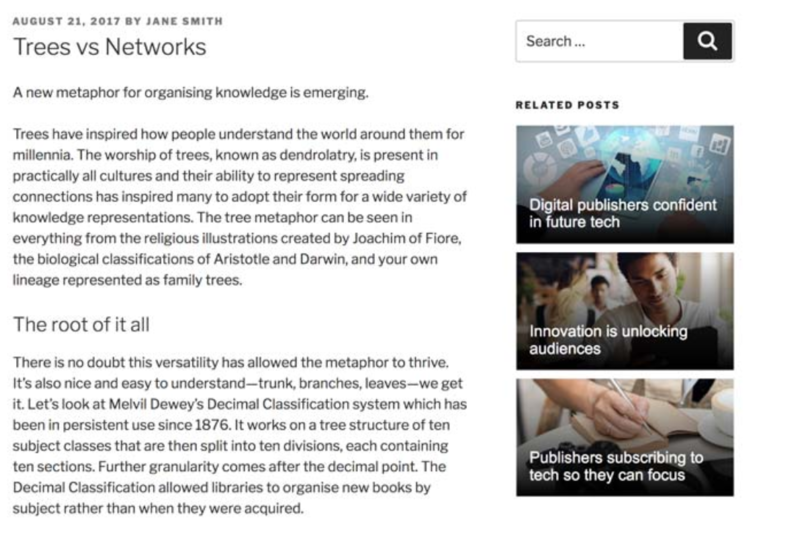 Through a few simple clicks, you can start displaying related content at the bottom of all of your blog posts. Bibblio is a relatively new content recommendation service that’s powered by artificial intelligence. That means Bibblio is constantly improving its recommendations as it “learns” new things, whereas most other related posts plugins are just using a static algorithm. Doesn’t let you manually select which posts are shown on a specific page. By the numbers, Yet Another Related Posts Plugin is the most popular related posts plugin in the repository. It lets you display your related posts as either thumbnails or lists and works on all post types. You have a ton of flexibility for where and how your related posts display if you’re comfortable with basic PHP. 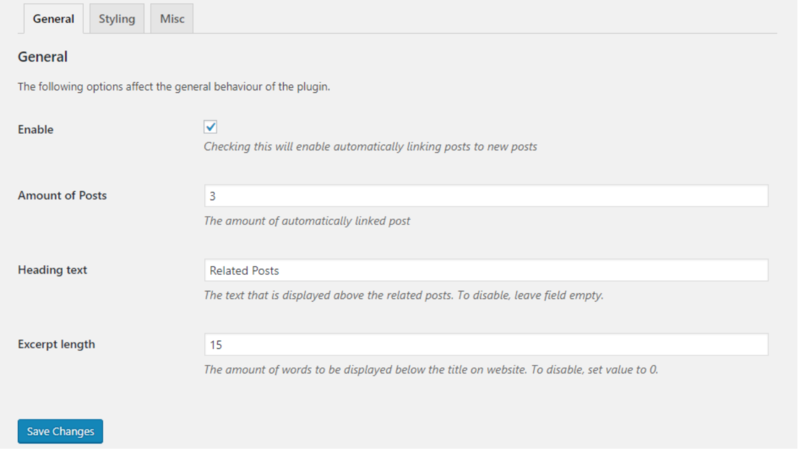 And you can also manually tweak the algorithm that Yet Another Related Posts Plugin uses to generate related posts. This is nice if you want to, say, exclude tags. 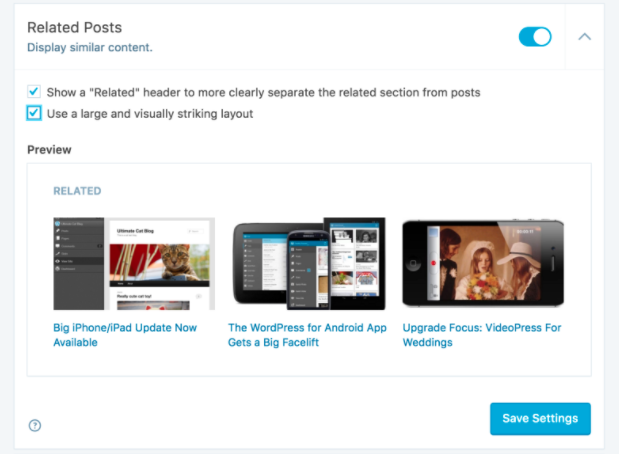 Related Posts for WordPress is a freemium plugin that lets you display related posts via both a shortcode and a widget. While it does process posts on your own server, its caching system helps it use resources much more efficiently. The free version is only good for regular posts, but the premium version offers support for custom post types, as well. Contextual Related Posts is another popular option that lets you display related posts with both a widget or a shortcode. 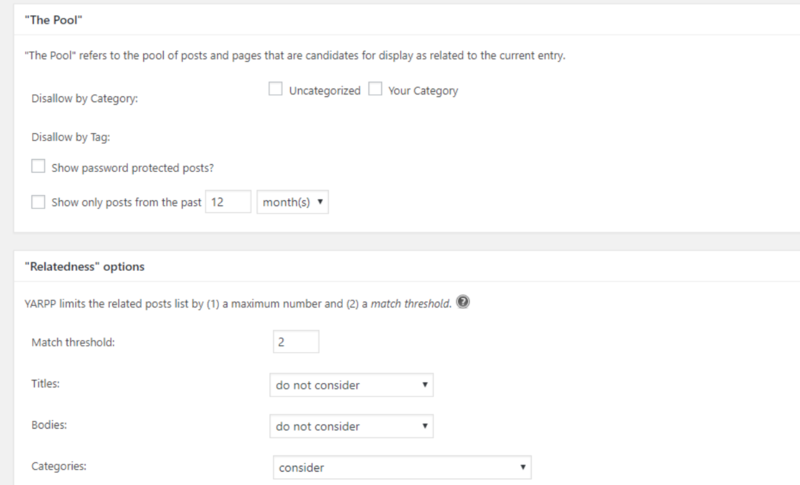 It supports custom post types, as well as a helpful option to exclude certain categories of posts (or individual posts) from being displayed in the related posts list. The main downside, though, is that it uses your own server to generate content recommendations and, as a result, ends up on the banned list at some hosts and might negatively affect your site’s performance. Lots of small style options for thumbnail sizes, metadata, etc. Which Related Posts Plugin Should You Use? It’s hard to give an overall recommendation because a lot of this comes down to the specific features that you need. For example, do you need a plugin that easily supports custom post types or are you fine with basic blog post recommendations? In general, I gravitate towards the plugins that use someone else’s server to process the related posts, which limits things to Jetpack and Bibblio. If you’re already using Jetpack and like how Jetpack’s default styles look, it’s a great option that won’t cost you a penny. If you want more flexibility and/or a potentially better algorithm, Bibblio makes it easy to get more creative with your related posts and also gives you analytics to see how effective they are. The only thing to consider is that large sites might need to pay because of the 500 post/25,000 recommendation call limits. Of these related posts plugins, which is your favorite? Or, do you like one that’s not on this list? Let us know in the comments! The post The 5 Best Related Posts Plugins For WordPress To Engage Your Visitors appeared first on Torque.